The comments below were written on April 26th and forwarded to the PrintOwners List Serv, but they never appeared on the list, because unbeknownst to me at the time I had been removed from the list a couple of hours prior. Nonetheless, I consider SPE to be one of the most important ratios to track in the printing industry so I decided to post the following. It is indeed unfortunate, that too many printers tend to either ignore, avoid, gloss-over or rationalize their sales per employee (SPE) numbers when compared to others. So here is the post that never made it to the list serv: (See interesting chart at end of post.) For those unfamiliar with this ratio, it is calculated taking gross annual sales (excluding postage income) and dividing that by the total number of employees, including all working owners/partners. “As a general rule, truly profitable printers in this industry become and remain very profitable not by charging significantly more or less for their product, but rather by producing those products far more efficiently. Efficiency and levels of productivity can be easily and quickly measured by SPE or Sales Per Employee….. I know printers on this list who are quite easily producing $1,000,000 in sales with between 5-6 employees….. that is an SPE of between $166,666 and $200,000! On the other hand, there are printers on this list with the same number of employees (5-6 employees) who are lucky if they are producing $500,000 in sales. I used to get so frustrated in on-site consultations years ago that a few times I broke out in a hives around my neck and back. I would get so frustrated trying to knock common sense and hard, cold financial statistics into people’s heads, and then I would have to put up with one damn rationalization and excuse after another as to why they couldn’t do what I recommended. Hell, on a few occasion some owners challenged me on my increasingly higher and higher consulting fees and asked if I was willing to guarantee the increases in profits and take a percent of the profits that I was promising…. I said “Sure, I will absolutely guarantee the results” but you have to allow me total and absolute authority to implement the recommendations I will make. I was usually met with dead silence at that point. P.S. 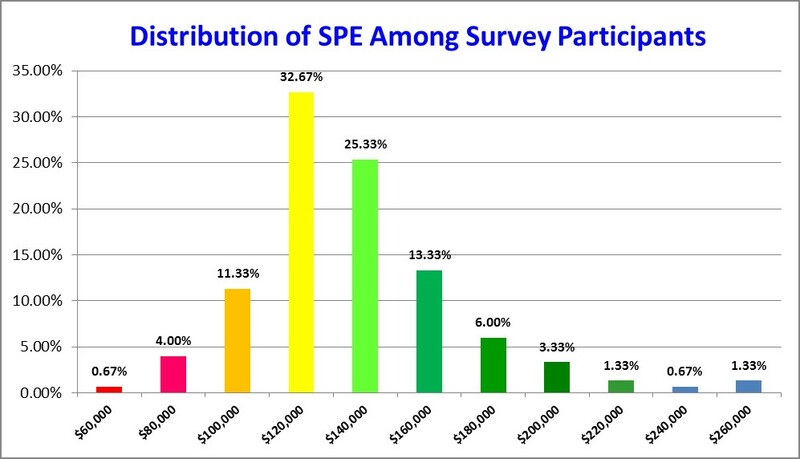 Below is a recent SPE chart taken from one of our most recent industry studies. Regardless of whether we are studying wages, financial ratios,or pricing of various products and services, the charts we prepare on sales per employee look strikingly similar to each other.